Last night at about 11:30, the seven of us staying at the CRASH Tono Base house were awakened (well, at least I was asleep – actually, one of the guys was in the shower!) by the strong aftershock that you are probably reading about in the news. We get several small aftershocks every day, but this one got those of us who were upstairs scrambling downstairs, and then the lights went out. Power was out in over 6 million homes across 6 prefectures (three of them in their entirety), and we figured it would out for a few days, so we conserved battery power in our computers and cell phones, and shivered with no heat. 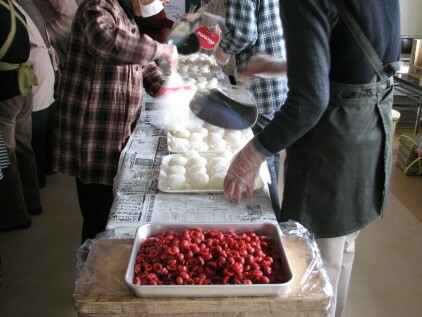 The only city-organized volunteer activity was the daily preparation of “onigiri” (rice balls, in this case with a pickled plum in the center) as part of the food plan for evacuation centers and a “soup kitchen” in a hard-hit town on the coast, so we all helped out. Fortunately there was enough light through the windows, and the rice cookers ran on propane. Starting with raw rice and ending with wrapped onigiri in boxes, the group of about 20 people made 1800 of them in 3 1/2 hours! I don’t know about the rest of the region, but at least here in Tono, Iwate, power was restored at 6 p.m., and we lifted up a prayer of thanksgiving for the speedy recovery. Thankful that your base is well prepared to deal with contingencies such as power cuts. Praying for you as you are the hands and face of Jesus to so many people who are in shock and need of practical aid and TLC. So glad to know that God’s plans march on despite power outages. Thank you for being the hands and feet of Jesus. We have been praising God for the amazing way He is moving in Japan. We heard through JCCC that a elderly Japanese woman in the disaster zone gave her life to Christ last week. She had heard about Jesus as a child and was so very touched by those of you who are serving and pouring out Christ’s love on her community. Please know that you are prayed for daily.